This week in the Kawuneeche Valley was awesome, the Kawuneeche Crew had 4 workdays with no rain, and we were able to finish the roof of the Little Buckaroo Barn! Monday and Tuesday we spent laying tar paper and OSB (oriented strand board) and more tar paper on the second half of the roof, and also replacing trim pieces of the siding that had been taken down to reach the rafter tails. Wednesday we laid down the 3-tab asphalt shingles over the hay loft and lower roof, finishing our second roof of the summer. Thursday we reconstructed the cattle corral we had disassembled to set up the scaffolding, and moved to the inside of the barn, spraying with bleach again, and sweeping up all the 70+ year-old debris. Then, to prevent further sagging of the roof from winter’s snow, we set up cross braces in the hay loft and in the ground level of the barn. A few of us also joined in a project on the east side of the park, putting on new siding on one of the historic Moraine Park houses. Crew dinner of the week: Lasagna on National Lasagna Day! This week the Estes Crew ventured back over to the Natural Resources again, as we did two weeks ago, but this time we were with the exotics division as opposed to restoration. Both restoration and Exotics have the same goal in mind for the park, to preserve and protect the natural history and resources of the park (plants specifically) through different methods. Restoration aims to plant and restore disturbed areas of the park, planting with native plants so that they have the upper hand on exotic plant species. 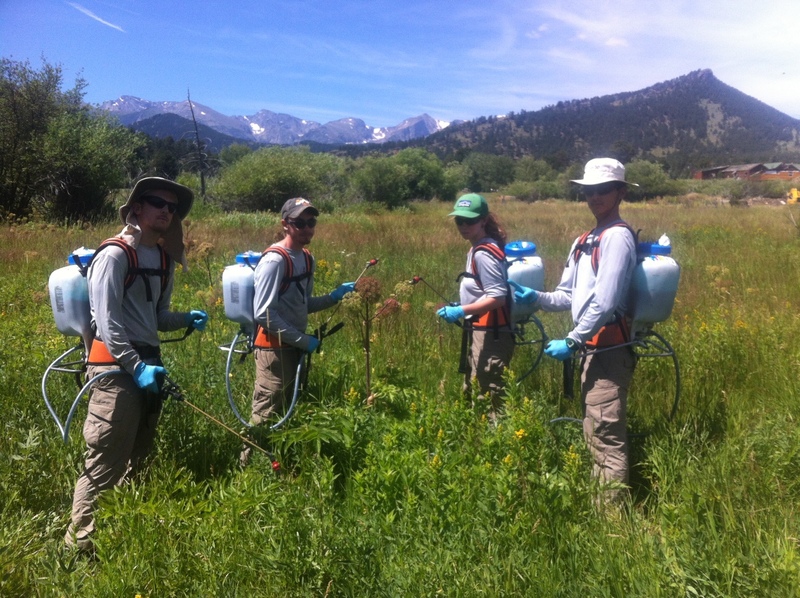 Exotics accomplishes the same goal through managing the invasive plant species that are present in the park. This can be done through physical( pulling or cutting down invasives) or spraying with herbicide. 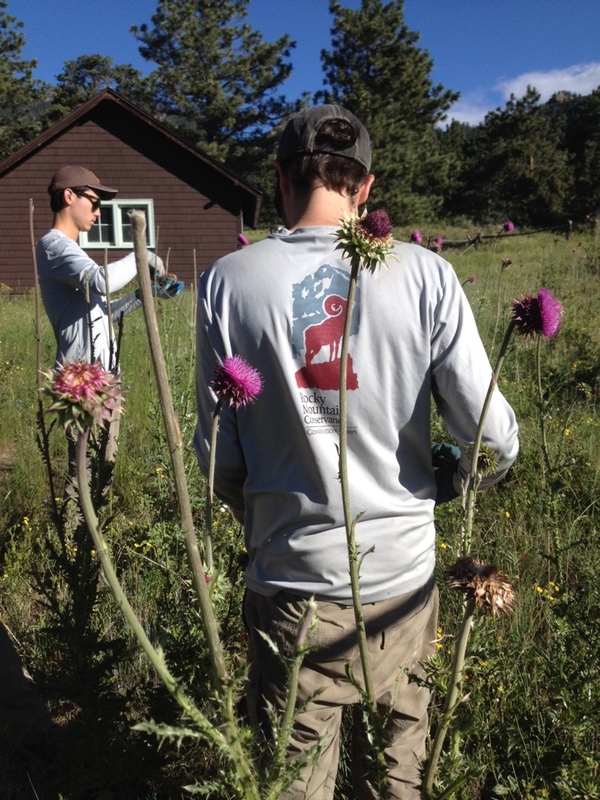 This week, on Monday, we spent the day performing physical invasive management on Musk Thistle, a large spikey, pink flowering plant and Wolley Mullen, in and around park headquarters. Monday afternoon, a wildlife biologist Joel Berger spoke to the Natural Resources division about his research with large animals, mainly Musk Oxen in Alaska. On Tuesday morning, we were trained by the Exotics team leader, Brad, on chemical maintenance of plants, how to spray, and that while although not the most popular choice seen by visitors in the park, is the most effective, while using the least harmful chemical possible. 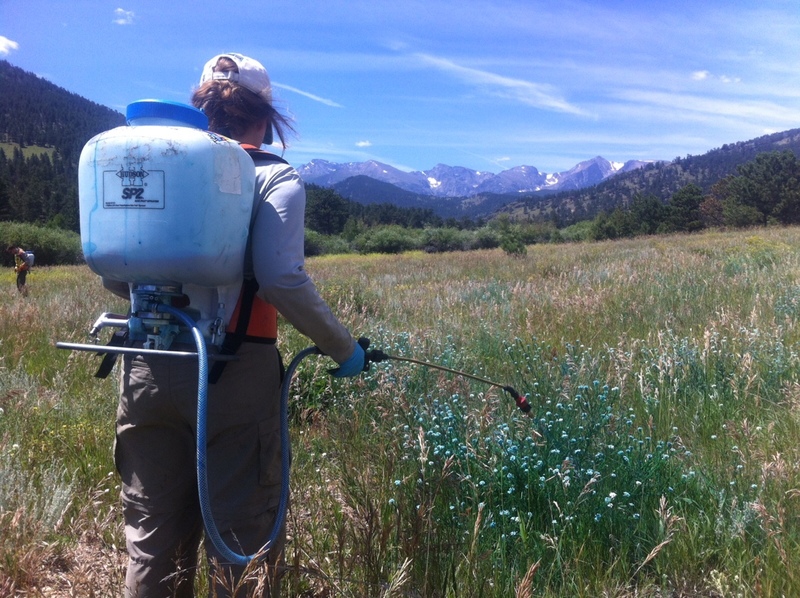 We spent the rest of Tuesday, and the following two days spraying invasive species such as Canada Thistle, Horray Allysium, and Knapp Weed, among others. Thursday afternoon we took part in our second “Round table” meeting, being part of a Career Development talk that we all found to be extremely insightful and inspiring moving forward to start a career in the next few years. We are looking forward to our last week of work out in the field with the trails division. 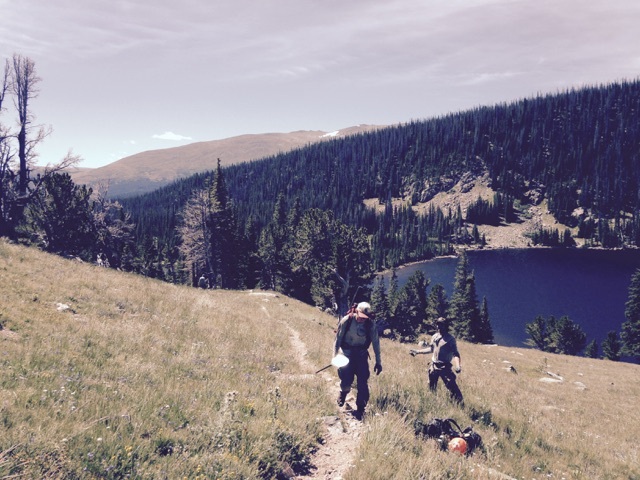 This week the Rawah and Red Feather Crews had the special privilege of working together on a four-day backcountry hitch in the Comanche Peaks Wilderness. Monday started off with a hike to the Comanche Reservoir to setup a base camp for the week. Base locations were scarce requiring a little extra effort from everyone. Along with both crews, Geoff joined us for the day and that evening. After setting up base camp, there was just enough time left to conquer the Comanche Lake trail. 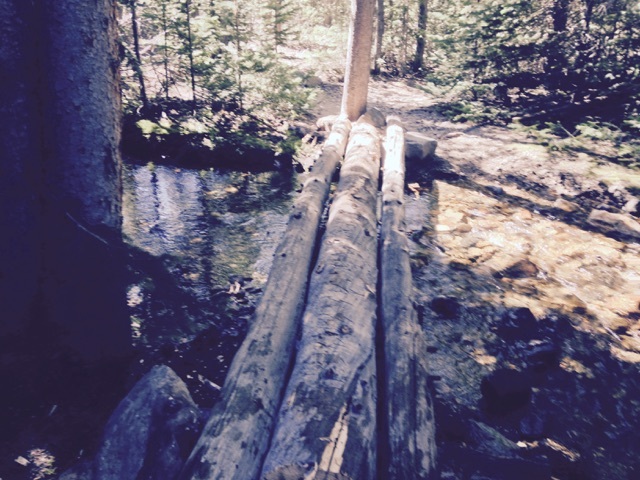 The 1.5 mile trail was in need of drainage work and corridor clearing. With 13 people, the work went very quick and we were back at camp for dinner. The mission for day two was to perform a maintainence run on the 5.0 mile Beaver Creek trail. The trail required a lot of drain work and some more constructive work on muddy zones. The last half mile of the trail was in the open alpine, offering incredible views of the area. After completing the entire Beaver Creek trail, we hiked all the way back to base camp just in time for some well earned calories. On day three we broke off of the Beaver Creek trail and worked the Browns Lake trail. Browns Lake was approximately three miles from our camp and after making quick work of the trail we decided to carry on into the alpine zone above the lake. Most of the work involved drains, clearing overgrown branches and clearing a downed tree. Once we made it to the top of a ridge we were rewarded with nice views of the Rawah’s and then a pleasant hike back down to base camp. Day four was a bit different from our other work days. Every morning throughout the week we had to cross a bridge that was a in pretty rough shape and there was also a bridge close to camp that needed some work. Noting these issues early in the week we decided to spend our last day fixing those issues. We split into two teams and one fixed the former bridge I had mentioned while the other team cleared brush around the bridge close to camp then cleared drains on the way out to the trucks. The former bridge required us to cut a dead tree to size and replace the previous trees, the work was satisfying and we were able to fit all six crew members on the bridge after it was built. 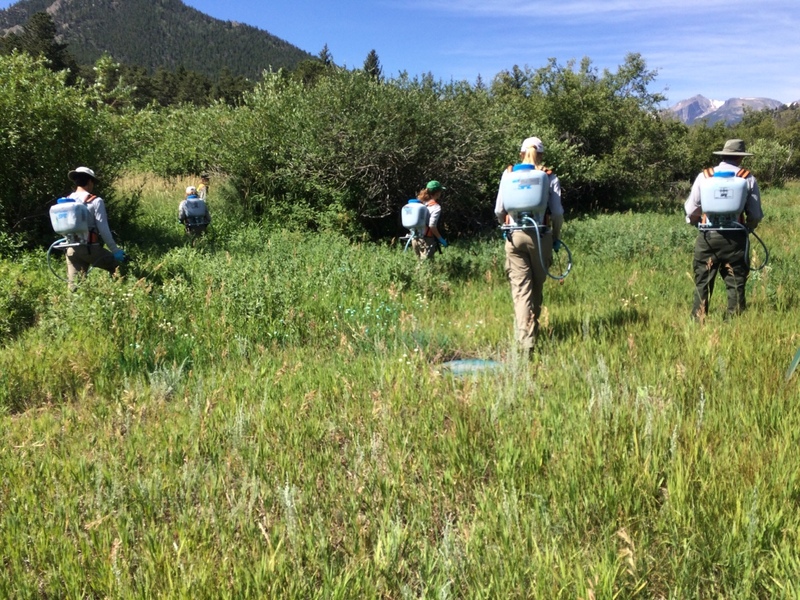 While maintaining over 18 miles of trail, the two crews worked in tandem to clear over 300 drains. 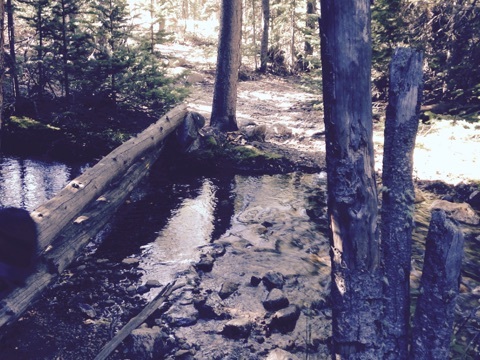 Beyond completing basic trail maintenance over the 18 miles, the crew members were also able to complete project work such as installing a new log bridge over a water crossing and rock steps in several muddy sections of trail. 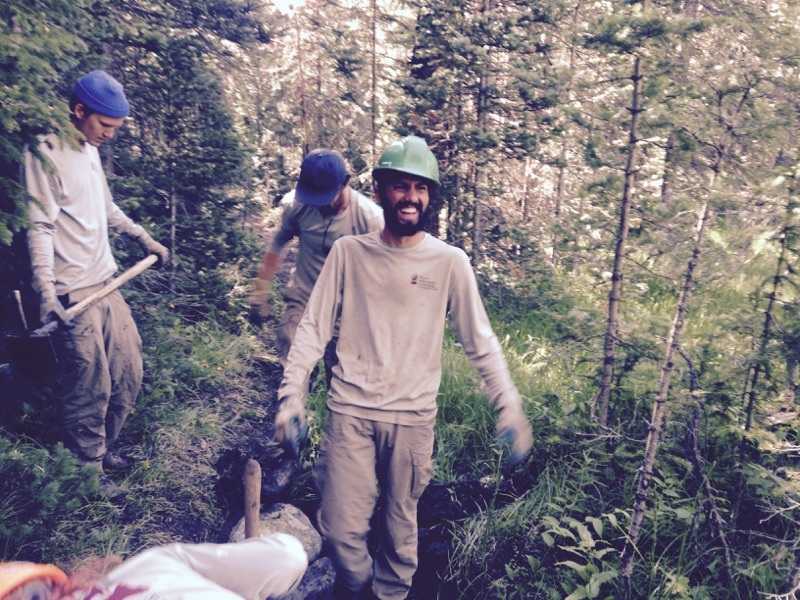 All in all, the week afforded the special opportunity for the Rawah and Red Feather crews to combine forces for a memorable week of backcountry trail work and fun in a new and beautiful area. This week, the Shadow Mountain Crew went on our last backcountry hitch of the summer, up to the Devil’s Thumb Trail on the Continental Divide. The trail runs up above treeline with few switchbacks or drainages, so it had become highly eroded and overgrown. We worked hard all week to rehabilitate this trail, which is heavily used as a section of the Continental Divide National Scenic Trail and as a day hiking route to the Devil’s Thumb, a 600 foot tall spire of rock on the east side of the divide. This was an exciting hitch because we got to work with a number of other crews and visitors. In addition to our crew of 6 and our 3 Forest Service partners, we worked with a crew of 8 from the Rocky Mountain Youth Corps. We also worked with a team of 5 mules (Jimmy, Bruce, Skid, Joey, and Rory) from the Rocky Mountain Regional Specialty Packstring, along with their lead mare, Ellie, and their packer and all-around champion of the west, Barrett. We also had a few VIP visitors during the week, including supervisors from RMC-CC and RMYC as well as the Rec Planner and District Ranger from the USFS Sulphur Ranger District. 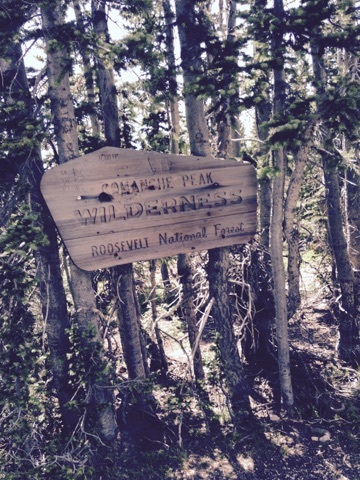 The project began with a character-building uphill hike to our campsite, just below treeline. We were grateful to the mules for carrying our tools and even some of our food! Upon arriving in camp, we dropped our camping gear and kept trekking up the steep trail to our project site, and began the tedious work of lopping out the overgrown willows. With such a large crew, we were able to work efficiently and cover the many jobs that needed to be done. One of my favorite jobs was collecting rocks with which to fill in old trail and construct dams and drainages. This meant spending a lot of time up on top of Devil’s Thumb Pass, looking down towards the Boulder Valley, and also getting to interact with the mules every time they came up for another load. We were lucky to have good weather all week long, but without any shade in our work area, the sun and wind were taxing! Other jobs included constructing check steps with large rocks collected from the area, digging drains and trenches to dry out a portion of the trail that was flooded by a spring, filling in the rutted old trail with gravel and brush, and widening and re-treading the parts of the trail that had become “cupped” from erosion. There was never a dull moment in camp, as the mules were always curious as to what we were doing, and especially what we were eating. (Jimmy and Skid both really like tortillas.) The near-full moon shone bright every night, and we huddled around the fire to keep warm in the cool air up above 11,000 feet. At the end of the week, we were able to look up at our work site and see that we had made some great improvements which will hopefully keep this trail in good condition for years to come! Now, the end of the summer draws near as we get ready for our last week on the Sulphur Ranger District! Much love from the Shadow Mountain Crew to you. Stay tuned for an update from Boulder’s 8-day backcountry hitch later this week!